I stood in the kitchen and stared at my new wall shelves. I still have one four foot shelf left over. But it’s messed up on both sides because Nathan accidentally drilled into it. But maybe we can fix it and add one more shelf. 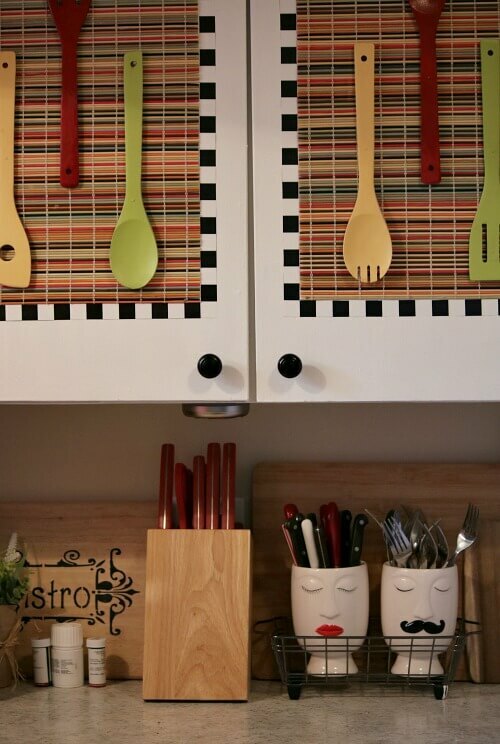 Then I’d have 3 four foot shelves on the wall over the kitchen cart. Yesterday I went to Tuesday Morning just to get out. It never seems to be crowded there. I found a sign I want to hang in the kitchen. So hopefully today we (or he) will get a bit more done in the kitchen. He’s also going to paint the wood underneath the cabinets by the floor. They’ve never been painted! I hate how they look and avoid pointing my camera toward them. Just when I got my kitchen all cleaned up, here we go again. Today Ivy has been at the storm door for over an hour. She was meowing and making those trilling sounds and looking very intently at something. Then I heard a gust of wind and Ivy was still as a statue. Guess what she’s so focused on? She’s staring at dry brown leaves that the wind has blown on up on my small porch. Of course the more sounds she’s making Charlie got interested. Charlie just looked out curiously. He was probably thinking there was a squirrel running along the fence bordering the alley or some other critter action. And Ivy’s still there. Who knows how long she will be focused on a couple of leaves blowing around? I am reading a very interesting book. 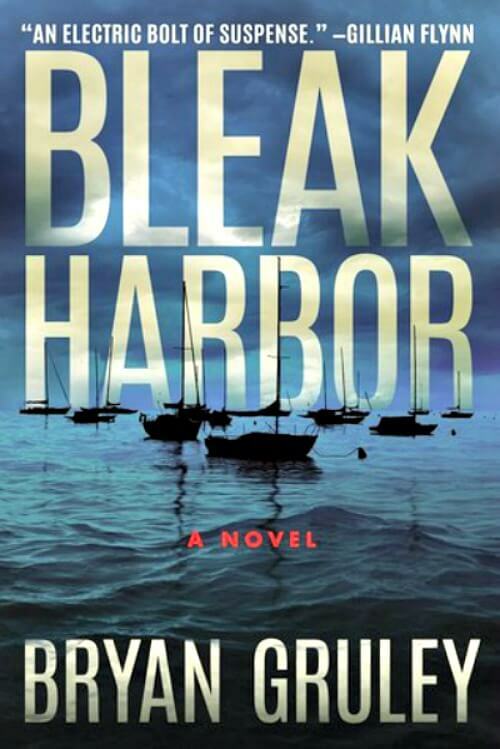 It is called “Bleak Harbor.” It’s hard to put down at night. It is about Carey and Pete and their 15 year old autistic son. Pete came into the picture after the boy was born, so he is really the stepdad. Danny is kidnapped and the kidnappers demand a ransom. A very odd number of cash for a ransom. Both Carey and Pete have recently done some dubious things, so they both wonder if that has anything do to with this. But don’t tell each other what they’re thinking. Pete, who owns a marijuana shop in town, wonders if it could be the shadowy man he bought some marijuana from who isn’t exactly on the up and up. But Pete’s shop was struggling and he just needed a little push to pay some bills. 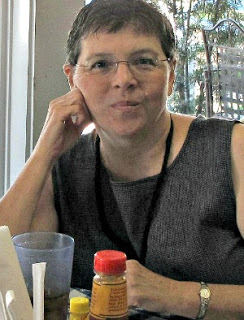 Carey is now trying to blackmail her boss with documents she seized from his office. He is also involved in some shadowy business dealings. She dreams of taking Danny and starting life somewhere else, without Pete. And she needs the money to start over. The reader goes back and forth trying to decide which one of them is being targeted. Meanwhile they keep receiving photos of Danny taped to a chair somewhere, with ominous notes about what might happen to him. I am really intrigued with this book. For one think Danny is on the autism spectrum, and I find it interesting to read about his never altered routine and compulsiveness. Everyone has a different range of symptoms that in some ways take over their lives. Like the rigid routines that he won’t let anything interfere with. The compulsive behavior of people on the spectrum, like the lining up of shoes a certain way. Or the two desks he insists on having, though no one can figure out why one isn’t enough. He is very drawn to dragonflies, and he knows pretty much everything about them. Some individuals on the spectrum have a very good vocabulary and talk in a formal old-fashioned way. Many find it hard to follow instructions with more than one or two steps. Nathan is now here. I will show you the shelves when we’re finished. Charlie’s getting a bit more patient with her. When he walks she jumps over him again and again. Yes! Was about to say the same. Ivy & Charlie are so adorable together!! Can’t wait to see new shelves + Tuesday Morning sign. All done! And have added a bit of Christmas to the shelves because I think it is the only place Ivy won’t get to. Showing tomorrow. Ivy’s trilling (and what I call “chirping”) are cat’s excited chatter when they see birds, squirrels, leaves, etc. Such an adorable photo of Charlie & Ivy side by side at the front door. A slow blink at humans is known as a kitty kiss and Ivy will receive your slow blinks back as kisses from her mama! She was focused on those leaves much of the day! 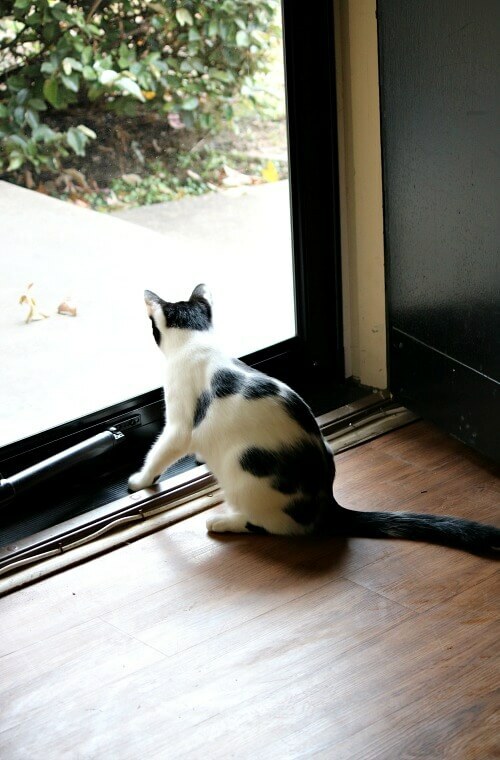 Our kitty Kramer does the chirping all the time at our door looking onto the deck he is always usually seeing birds and insects when he does this .It can get very loud and he is very still but his tail usually is swishing .I love to watch this. Charlie and Ivy Lou are great friends now I think he is warming up to her . Ivy’s tail was swishing back and forth and thumping while she was at the storm door. I hope you had a great weekend! Ivy and Charlie are so sweet! I love reading about them. Sweet dreams to the 3 of you. What a bonus–another shelf! Can’t wait to see. It must be that Charlie is feeling some better since he’s tolerating Ivy’s antics more easily. Ivy’s “stalking’ of the leaves is amusing. 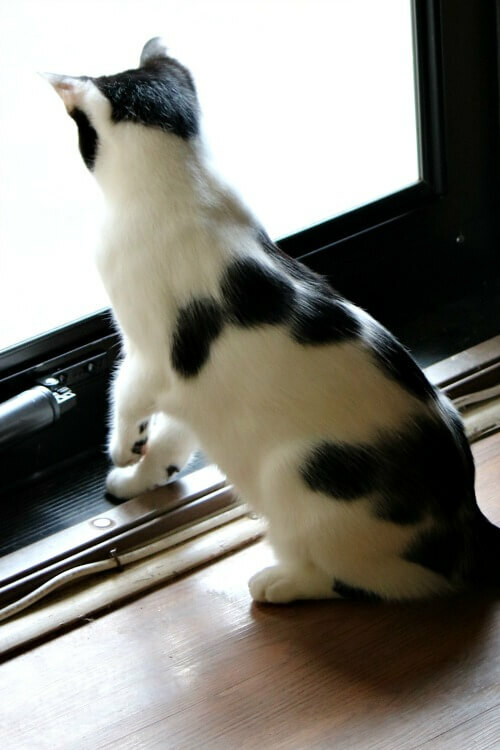 If she could only get out there and pounce on them! What did you ever do for entertainment before Ivy? Well, we had our family Thanksgiving yesterday so that is over “thankfully!” The food turned out well and the four boy cousins played quite happily together, too. They do pretty well when they are together except when Liam, the three-year-old is feeling left out. That’s not too often, though. The others include him most of the time. I am looking forward to tomorrow when I’ll have the house to myself for a few hours again. Boy, I miss that when they’re all home for several days. I find myself wishing very frequently lately for my own place. I’d even be happy with an apartment in the garage! It’s a two and a half car garage so it’s big enough. Although that would be against the city zoning codes. It would be so convenient as I would have my own private space but be close to the boys, too, and be able to stay in my neighborhood which I love. Oh, well, pipe dreams, at least for now. Bedtime now. I hope you three are all tucked in having a restful sleep. I, also , love the photo of Charlie and Miss Ivy Lou at the door. I never realized how small Charlie is! Ivy is so funny, all absorbed in a couple of leaves blowing around – but hey, anything that keeps her entertained, right? I think adding the additional shelf was a great idea! It looked great before but now, looks much more balanced (from your Christmas post). 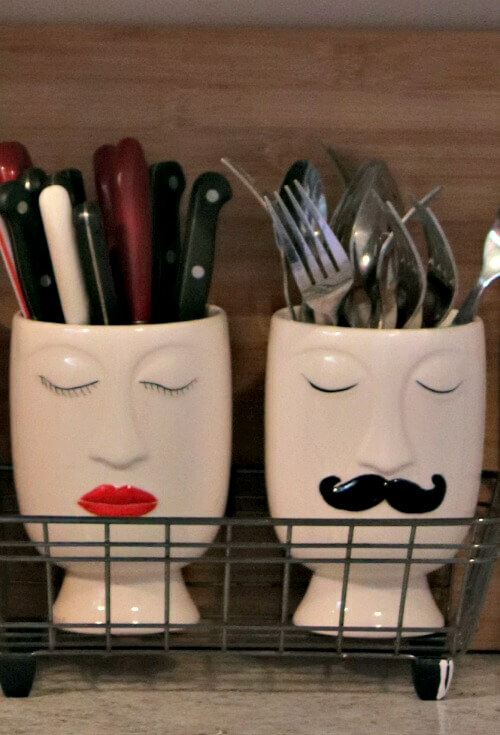 LOVE those utensil mugs you have…absolutely adorable! 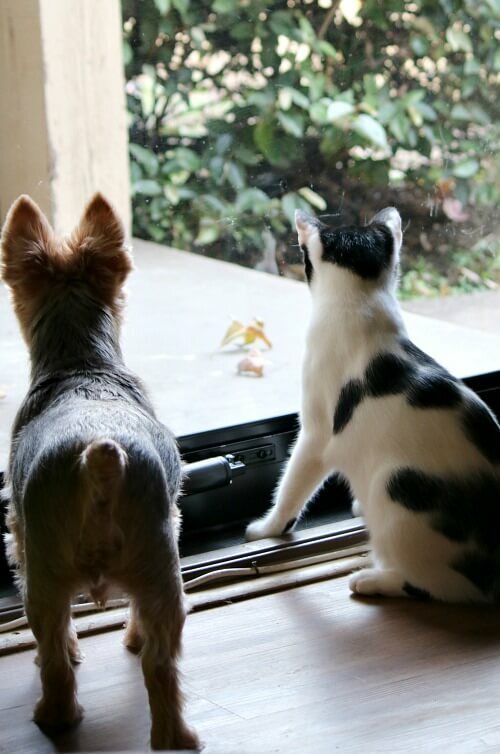 Leaves…who would have known they could keep animals occupied…LOL. Love and hugs! This made me think of you & Ivy.